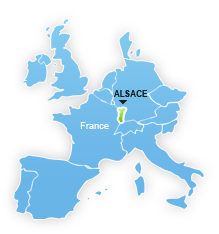 Located at the crossroads of France, Germany and Switzerland, Alsace is an incredibly diverse region. Naturally, culturally and historically rich, the country of the storks and pretzels may be discovered in many different ways... Regardless of your choice, Alsace promises you an unforgettable holiday ! This region has all the infrastructures to accommodate tourists and holiday-makers from around the world. All the campsites in the area welcome tents, caravans and motorhomes. The camper will find all the necessary services for a comfortable holiday. Many campsites are also equipped with bungalows, cottages and mobile homes. Whether you coming for the weekend or for a longer stay, on your own as a couple, between friends or with family, the Alsace region is brimming full of treasures and with something to satisfy everyone. Do not and hesitate ! Come and visit Alsace for your next holiday. Discoveries, fun, adventures and relaxation will be on the agenda and you will leave with a head full of unforgettable memories.